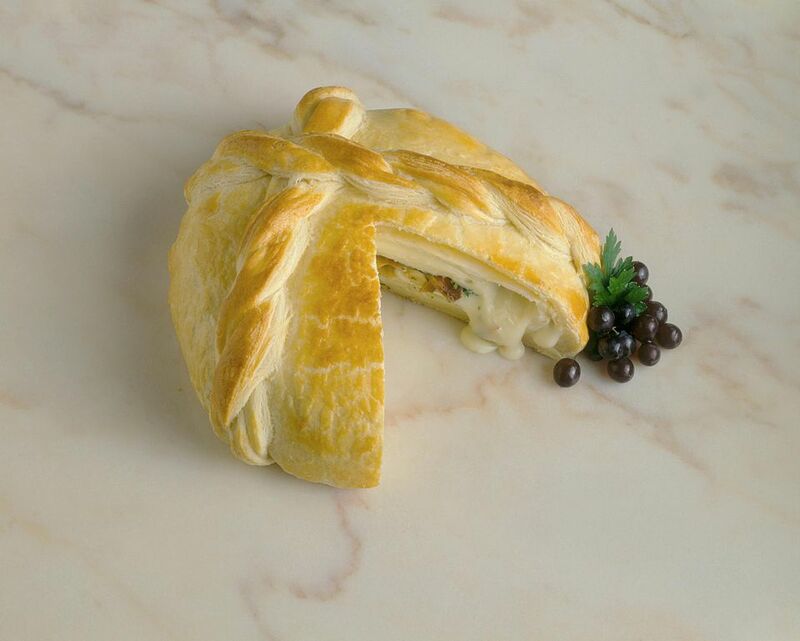 Making your own pastry covered baked Brie is so simple to do that you may never buy it again. This version has a layer of caramelized mushrooms and shallot under the dough. Serve warm with crackers and fruit. Thaw the puff pastry at room temperature for 30 minutes (or follow the package directions for thawing). Lightly grease a baking sheet. Preheat the oven to 400°F. Whisk together the egg and water in a small bowl. Add the mushrooms and shallot and cook, stirring often, until softened, about 10 minutes. Add the sugar, salt and pepper to the mushroom mixture and cook, stirring often, for 5 minutes more. Remove the skillet from the heat and let the mixture cool completely. Unfold the thawed puff pastry on a lightly floured surface. Using a lightly floured rolling pin, roll the pastry into a 14-inch square. Trim the pastry to make a 12-inch circle. Reserve the pastry scraps to make decorations if desired - see Recipe Notes and Tips below. Spoon the mushroom mixture into the center of the pastry round and spread into a 6-inch circle ( or the diameter of the Brie wheel). Top the mushrooms with the Brie. Brush the edges of the round with the egg wash. Fold the pastry edges over the Brie and press the edges together firmly to seal. Place the wrapped Brie seam side down on the prepared baking sheet. Bake until the pastry is golden, about 20 minutes. Remove the baking sheet from the oven and let stand on wire rack for 1 hour before serving. • Be sure to use cold Brie straight from the refrigerator, this will help keep the pastry from getting too warm and soft before baking. • The soft white rind on the Brie is edible, so there's no reason to remove it. • To decorate the top of the pastry, use a rolling pin and roll out the small pieces of the extra dough. Cut out the dough with small leaf cookie cutters (or use a small sharp knife). Place the leaves on top of the Brie covered pastry. Roll any remaining dough pieces into long thin ropes to use as vines. Brush the decorations with the egg wash and then bake as directed. • You can make the baked Brie up to 2 days ahead. Refrigerate it in an airtight container. When ready to serve, place it on a baking sheet and bake at 350°F for 15 to 20 minutes.